Can the liars of the world really be blamed for their character? From the time we are able to speak we are taught how to lie. From Santa Claus to the Easter Bunny and every other silly thing that adults like to tell children, like the stork, the tooth fairy and maybe even God, we are led to believe in something in our most impressionable years and then are cruelly told, usually by an older sibling or a childhood pal in the schoolyard, that everything we have ever believed in, everything that the most trusted adults in our life had assured us is real, is in fact a lie. You’re taught right from wrong, good from bad, so if Mom and Dad told you a lie about Santa Claus, then lying must be okay right? Is there a line when it comes to good and bad lies? And if so when do you cross it? Are there good lies, and if so what are they? Are any of these expectable lies? I have lived a lie many times throughout my life, usually for employment but sometimes for survival. In fact as a writer the only way I get paid is to lie. So where do I fall on the lie scale? This category pretty much covers all of us, from the person who lies about why they are late for dinner to the parent who tells their children that a rabbit hides chocolate eggs around the house once a year. Most people don’t like to lie and are not very good at it, but they’ll do it to avoid an unpleasant situation or because they don’t want to admit to doing something embarrassing. Think 'You'. 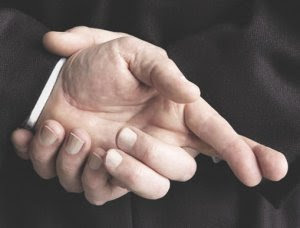 Frequent liars know lying is wrong, but it doesn’t make them as uncomfortable as the Occasional Liar. For this reason, they are more likely to lie regularly and are less likely to reveal lies through their appearance. Think 'Player'. Habitual liars are fairly uncommon. These are people who have difficulty separating fact from fiction and who say whatever comes to their minds no matter how exaggerated, ridiculous, illogical or untruthful it may be. Habitual liars lie so frequently that they never show physical discomfort, but they are so sloppy with content that they are easy to catch. Think 'The One-Upper'. Professional liars have thought their lies through and know exactly what they’re going to say and when. Because the lie has been practiced so often, it will not be revealed by the liar’s voice, body language or appearance. Think 'Salesman' or 'Writer'. I am a liar. Don’t believe anything I say. I am telling the truth.